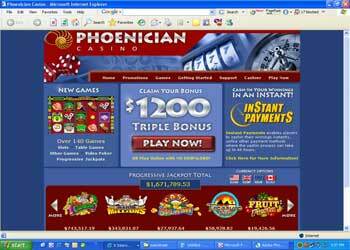 Gambling World is Proud to Present Phoenician Casino! When you are looking for a fun place to play some really cool casino games, Phoenician is the place for you. High end graphics with realistic sounds all contained within a quick and easy free download, you too can quickly experience beating the dealer in a hand of blackjack, or being the next big winner of a progressive jackpot, or winning at one of the other over 140 games. Breaking new ground in the Online Gambling world is the policy of Instant Payments at Phoenician. This allows players to receive their winnings not only fast like most of the casinos we recommend here at Gambling World, but, with this method players get their cash-ins "Instantly"! Full details are available at the website and there are a few restrictions, such as maximum daily withdrawal limits and so forth, but their terms are fair and straight forward. This really speeds your payouts and the main reason we like playing there. Having the Instant Payment policy is just one way that the management takes care of it's visitors. They also make sure that the support staff is available for questions or help with any facet of the casino, gaming software, payments or anything else a player may need at any time of the day or night. New players are eligible for up to $1200 in deposit bonuses with their first 3 deposits. On your first deposit you get a 50% match bonus up to $50. For the second deposit you get a 25% match up to $200 and for the 3rd you get a 20% match up to $950.